Your Columbia connection to the world of finance and economics. Students joined representatives from Goldman Sachs' Investment Banking Division for a presentation, followed by a networking session on working at Goldman Sachs. Recruiters, VPs, and directors from Citibank’s Sales and Trading Division gave a presentation on the division, followed by a networking session on Wednesday, April 11. Mike Newton, the Director of Cross-Asset Strategy at Citi presented, giving insight on life in the Sales and Trading Division, while also sharing his experiences in the industry. The Sales and Trading Division head recruiter also presented. 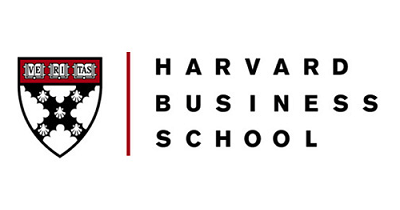 Director of Admissions Deirdre Leopold spoke about the HBS 2+2 program for college juniors as well as regular MBA admissions. Undergraduates of all years, majors, and career interests were invited to attend. Our panel of three current Columbia students shared insights into their experiences in investment banking at Goldman Sachs, graduate school at Columbia’s School of International and Public Affairs, and economics research. Students had a chance to hear our speakers discuss their career choices, followed by some time for more individual questions and answers. The Boston Consulting Group hosted Coffee Chats on September 28th at Joe Coffee for interested Summer Associates. Students were given the chance to speak with BCG Representatives about career opportunities at BCG. These Coffee Chats were intended for students graduating December 2018 to December 2019. Professor Brett Martin (Columbia Business School) and David Ronick (Founder and CEO of WinWin) discussed the latest FinTech innovations and trends, filtered through a career-oriented perspective tailored just for Columbia undergraduate students. Brett Martin is the co-founder and Managing Partner of Charge Ventures, a pre-seed focused venture fund based in Brooklyn, NY. David Ronick is the CEO of WinWin, the mobile savings app, and was previously the CEO of StashInvest (mobile app) and CreatorBox. Current students at Columbia Business School joined us for a panel Q&A on how to be admitted to a top business school. Students had a chance to hear about the panelists' experiences leading up to CBS and what helped them get there! Representatives and recruiters from Barclays Investment Banking Division provided insights into working at Barclays. Students joined Columbia Economics Society on a visit to Greenhill, a leading independent investment bank, for a firm overview followed by networking with team members, including current Associates and Columbia alumni, Graham Johnson and Jamnah Morton. 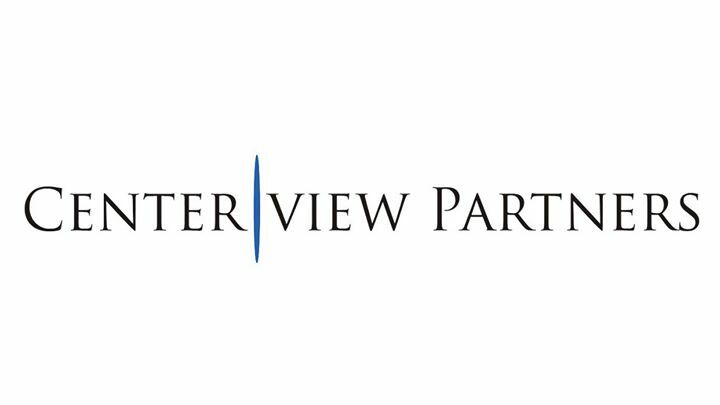 Centerview Partners will hosted an interactive investment banking interview preparation workshop. During the event, small groups of ~5 current Columbia students were paired with a current Centerview banker to review common interview questions and tips for investment banking interviews. 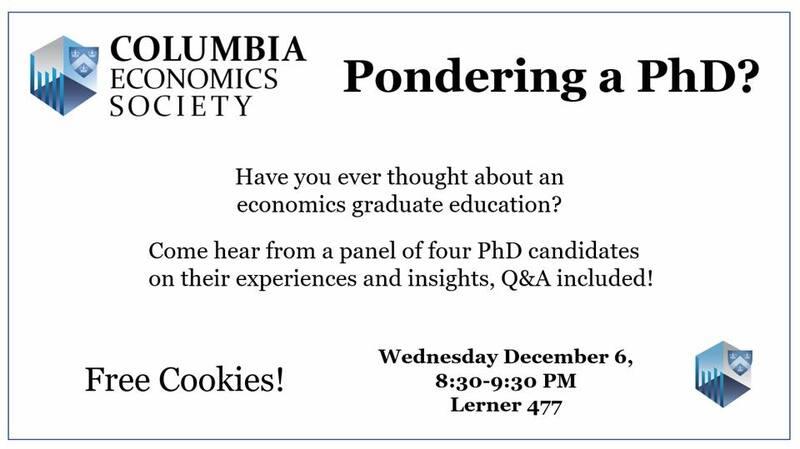 Undergraduate students had an opportunity to hear from current Columbia economics PhD candidates about their experiences in pursuing a PhD. Our accomplished panel of four current PhD students shared insights into the motivations, challenges, and benefits of studying economics at a graduate level. Columbia Economics Society and Columbia Investment Banking Division were proud to present an opportunity for undergraduate freshmen and sophomores to sit one-on-one with students who have completed banking internships at Citi, Barclays, and MUFG to figure out whether banking is the right industry for them. Free hot chocolate! Novantas, Inc., hosted a coffee chat on the morning of Friday 4/13 at Joe Coffee in NoCo for students interested in learning more about the consulting industry and lifestyle featuring recent alumni from the classes of 2016 and 2017. 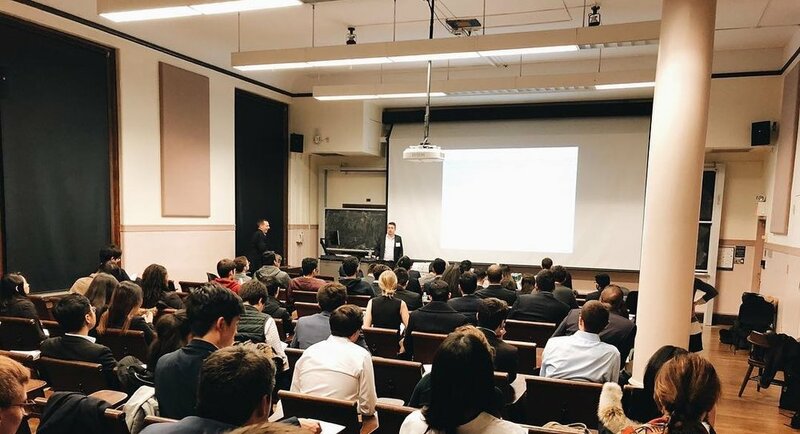 Columbia Economics Society held a 2-day, intensive seminar for students interested in a career in finance -including investment banking, private equity, sales and trading, equity research, asset management and other positions. Students joined Columbia Economics Society in welcoming the Editor-in-Chief of one of the most accomplished magazines in the world. Zanny Beddoes is the first female Editor-in-Chief of The Economist, and has been working at the magazine since 1997. A short talk about her life and achievements was followed by a Q&A Session afterwards.